Colleges and universities across Ontario are investing in a greener future. More post-secondary schools are turning toward developing LEED certified buildings. LEED stands for Leadership in Energy and Environmental Design. It is a green building rating system administered by the Canadian Green Building Council. Mohawk, George Brown and many other colleges and universities across the province are in the midst of or have developed sustainable LEED-certified spaces. Humber already has two buildings that are certified, the Centre for Urban Ecology and the Learning Resource Commons with a third building, the Centre for Technology Innovation, now under construction. LEED buildings are rated at different levels of certification based on points, ranging from certified, silver, gold and platinum, and with points being given towards that certification. 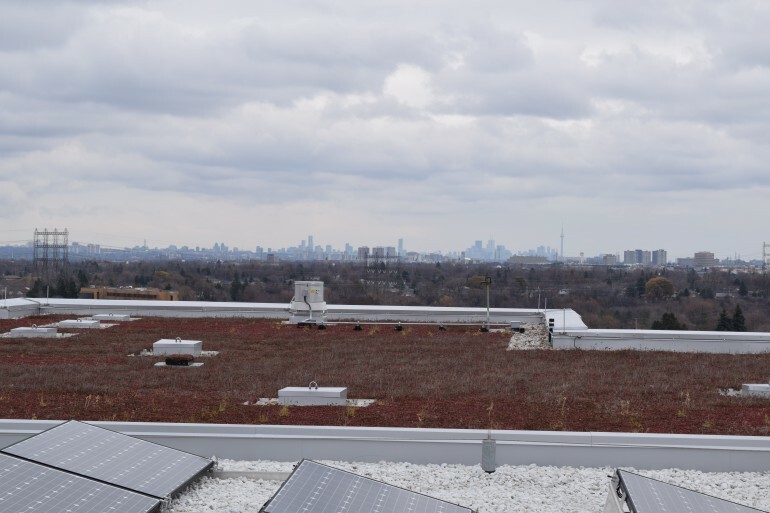 “In a LEED building you want to save as much energy as possible,” said Janine Vanry, Conestoga College professor of Engineering and Information Technology. “Basically, you obtain points based on that threshold of energy that you save. “Other things that we see is water use reduction, so trying to not use as much water, or recapturing some of our water to say flush toilets for example. Using more eco-friendly products or recycled products,” she said. The lifecycle of the building — design, construction and use — is considered when looking to develop sustainable spaces, Johnston said. Consideration goes into where the materials come from, recognizing the carbon costs that go along with transporting materials from further away, he said. “We look at energy and atmosphere, we look at the water efficiency, we look at the materials and resources, all of those factors come together to look at the lifecycle of the building,” Johnston said. “So yes, you’re going to pay a little bit more up front in design and construction but your operational costs and the environmental impact of your operation is going to be reduced over the life of your building,” he said. The industry has been revolutionized, and with that prices for green products have gone down over the couple of decades LEED has been around, Vanry said. The pay back on these buildings can be as early as one to two years to recoup costs, she said. The buildings do provide a more sustainable and environmentally conscious atmosphere with many different elements going in to obtaining a certification. The buildings create a more environmentally friendly space, right down to the materials used. “Energy is the biggest one, which is always a good thing that we aren’t contributing to CO2 emissions, the building actually uses less water on average, probably about a 30 per cent reduction,” Vanry said. “LEED really likes to see environmentally preferred, so it might be the paint or the coating that usually have high VOC (Volatile Organic Compound), bad stuff for us to be inhaling, helping the occupants feel better,” she said. The province announced in February grants for colleges and universities to lessen greenhouse emissions through its Greenhouse Gas Campus and Retrofit Program. The plan is part of the inspiration for many campuses to move toward developing LEED-certified buildings along with the longevity and sustainability that they provide, Johnston said.